PLEASE NOTE: Due to new regulations pelagic trips can no longer be run from Lima/Callao.This has forced us to change to Paracas as our departure and return point, which does present a logistical challange. Please contact us for more information on how to plan for the change. Peru boasts an impressive number of sea birds species and decent number of marine mammal species. The current list of birds stands at 69 species of birds and cetaceans 33. Kolibri Expeditions, with +20 years of pelagic birding experience, invites you to join us on one of our specialized pelagic birding and/or whale spotting expeditions. A limit of 16 birders (the boat can carry 40) allows us more hands on time with each person. The two available speed boats have modern and powerful 2 engine (100-200 hp each) allow speeds around 20 knots, and take us out to about 30 nautical miles. This is essential to see rarities’ such as Markham's and Ringed Storm-Petrels. This gives us about two hours of chumming, and covering a greater area, meaning more birds and cetaceans. 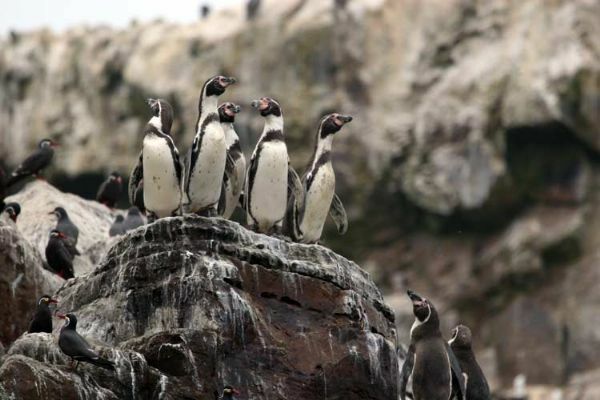 We do a stop at the Guano islands of Ballestas for closer views of Humboldt Penguins. Being back in port by 11 means you can have a scheduled flight this day in the late afternoon or evening . Calculate about 4 hours to get to the airporrt from Paracas. Chumming. We concoct a special “seafood soup” with left over’s and popcorn or popped rice. It is not unusual for the chum to attract 100’s of birds. 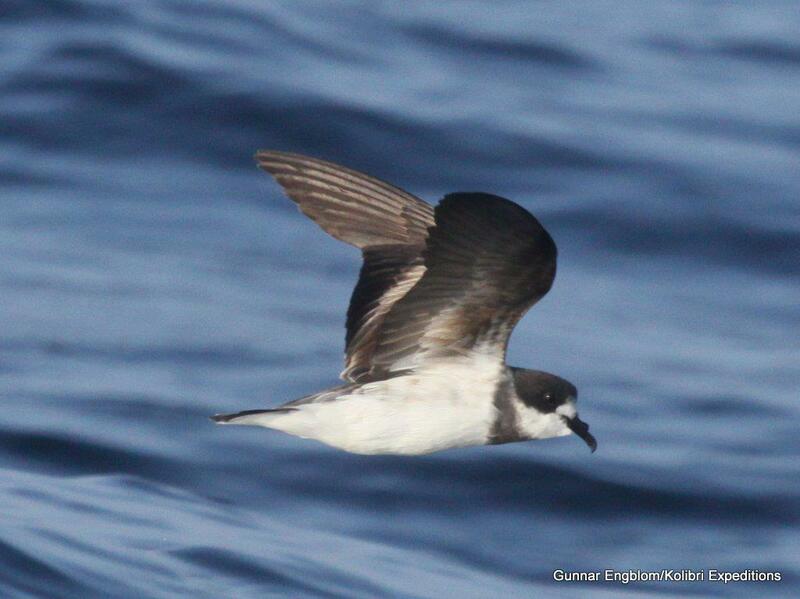 Including a variety of storm-petrels and several other species such as Waved and Salvin’s albatross. Transport to Paracas is provided only if you are booked on an extended (2 day) trip or another tour with us. If not you will need to make arraingements either with a bus service or personal transportation, keeping in mind that the tour leaves at 5am. The risk of getting wet. Dress appropriately and PROTECT your equipment. Kolibri Expeditions IS NOT responsible for lost or damaged equipment. The seas can be rough. Generally Peruvian waters are relatively calm and trips are rarely cancelled due to bad weather. If you suffer from sea sickness be prepared. There are medications available. That we respect wildlife and certain situations dictate that we cannot get too close to some animals and habitats. The rocky island shores for instance. That although we will pause to look at cetaceans if we come across them, birding is the primary purpose. The deep sea pelagic trips are run year round. Different seasons yield different sightings, June-Aug being particularly good for Albatrosses with up to 5 species recorded on a single trip. Other great birds we frequently see include the Sooty Shearwater, Cape Petrel, Markham´s, Hornby´s, White-vented, Wilson´s (Fuegan) and Wedge-rumped Storm-Petrels. Swallow-tailed and Sabine´s Gulls. Waved, Gray-headed, Black-browed and Salvin´s Albatross. Peruvian Diving-Petrel, Chilean and South Polar Skuas. Less frequent are these species recorded from the now suspende Lima Pelagics, but should well be possible also from Paracas. Northern Giant Petrel was recorded and photographed for the first time in Peru in 2002 and has proven to be not uncommon in season May-November. February 2003). Buller's Shearwater (Dec 2005, Feb, March April, June 2005,) and Buller''s Albatross (Nov 2005, Sep and Nov 2006, Nov 2017). Chatham Island Albatross on 10 occations. In 2012 we had the first Peruvian record of the Gray-backed Storm-Petrel. Inner shore birds include Humboldt Penguin, Peruvian Pelaican, Peruvian Booby, Blackish Oystercatcher, Inca Tern, Belcher's Gull, Surfbird, South American Tern, Guanay and Red-legged Cormorants. We can usually guarantee an outing with a minimum of 7 birders at list price, but even with 4-6 birders it is usually possible with a surcharge of $50 (6 birders), $100 (5 birders) or $200 (4 birders) per person. We may ask local residents to join at reduced price to make up the numbers to cover the operational costs, and this way somewhat buffers surcharges for you. If you are committed to pay the surcharge at 4-6 people if we don't get any locals, then your pelagic trip is guaranteed to run for the date you choose, as long as we can reserve a boat ahead of time and you make a prepayment . Price as of 2018 is $300 plus port taxes ($5.00) . Contact us for more info. Transport to Paracas is only provided if you are doing an extended (2 day) tour to the south of Lima or another tour to other parts of Peru. We can advise you on transport and accomodation if you need these services. You may also rent our van and driver for independent birding if it is available. .